Now I know what you’re thinking – it’s less than a week to go until Christmas, it’s simply not possible to knit a sweater in that time and to even contemplate such a thing would be the height of madness. Please just rock quietly in that corner while I fetch some nice men in white coats and pad the walls of the spare room. When I made this, I did it in three days. THREE DAYS. Obviously this is because it is knit with huuuge yarn on giant needles. But the real genius of the pattern is that this does not result in a vast, shapeless, sack of knitwear that you could hibernate it. Oh no, instead it gives you a pretty, flattering, and fitted lace cardigan. When I say fitted, I mean it. 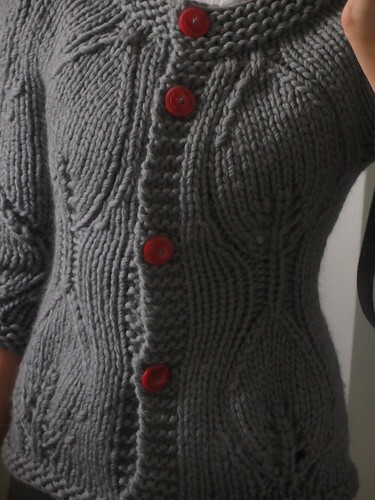 You want to keep your knitting nice and loose and if I make this again (it’s on my mental list of things to remake) I would go up a size on the sleeves and add a few more stitches under the arms – they are very snug and my arms are gangly sticks. With the body however, you want to keep enough negative ease for the shaping in the lace to work. So go! Knit on my friends! Laugh in the face of the Christmas Knitting Elves and bask in the glory of making a sweater in record speed. I love that pattern! What a great knit and who doesn’t love things that are quick projects. Happy Holidays!